Loblaws Flyer Special Sale 5 Feb 2019 contains super deals for you. Let’s click on the image and see how they are discounted for this week. These products just discounted for a one week. Grocery sale and meat sale available this week. For a better dinner, visit a Loblaws store. For a romantic night, Loblaws’ meat varieties would be great choice. Pick your favorite and make special dinner with discounted ingredients of Loblaws. Healthy food opportunities and special prices available in this flyer. RIPE AVOCADOS – OH YES WE DID EVENT ON NOW COME AND SEE ! 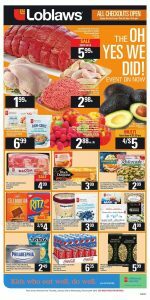 Loblaws Flyer Special Sale 5 Feb 2019 available only for this week. Check out all good foods and make your own savings. Daily deals, special sales, and daily beasts waiting only for you. Enjoy your shopping every day with Loblaws.